Children researched some of the diary entries of Sarah Ponsonby and Eleanor Butler, otherwise known as ‘The Ladies of Llangollen.’ They dressed up and acted out scenes from their lives which were photographed Holly Edwards and displayed as part of an exhibition at Plas Newydd. Year 3 and 4 pupils form Ysgol Frongoch and Ysgol Heulfre in Denbigh were guided in an oral history project and presented their findings in the form of an interactive exhibition at Denbigh Town Hall. The information was then used by the pupils to devise and perform a play called ‘Somebody’s Baby’. Year 7 and 8 pupils from Denbigh High School worked with Polly to write a brand new book about the hospital, in an attempt to make historical facts and real-life memories more accessible to younger readers. 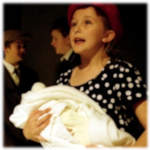 Based on the real-life 1938 diary of a girl called ‘Betty Lavender’, pupils from 16 different primary schools worked with Polly to interview friends and relatives about their wartime memories. 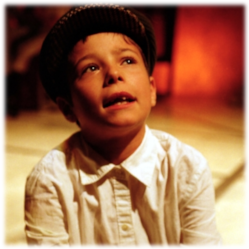 All of the true stories were then woven into a fictional play about Betty and her brother Sam, which was first performed by 180 children at Hull Truck Theatre. 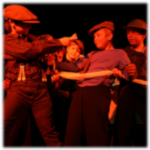 Since then it has been performed by over a thousand pupils in Yorkshire and Derbyshire. Pupils also took part in writing workshops to create diary entries for the characters and these were published as the books ‘Betty’s War’ and ‘Sam’s War’. A film made by children from Ysgol Gwynedd based on stories of witchcraft trials from The Old Courthouse in Flint. A day working with Celtic re-enactors at a traditional roundhouse at Ysgol Rhos Helyg plus a visit to an Iron Age Hillfort across the road from the school led to a fun and immersive learning experience for these children in Year 3 and 4.